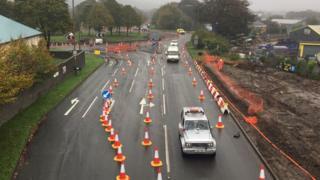 Congestion because of roadworks "chaos" at a major Valleys roundabout has cost the local economy almost £400,000. There has been more than three times more traffic jams at Caerphilly's Pwll-y-Pant roundabout since the roadworks started in October, traffic data shows. Business expressed "gravest concerns" about the work's impact on trade and the area's MP and AM have told the council of their "very real concern". Caerphilly council said the £5m improvements would reduce congestion. The Pwll-y-Pant junction is a "key strategic location" on the A469 north of Caerphilly town centre which connects Rhymney Valley towns such as Ystrad Mynach and Bargoed to Caerphilly, Cardiff and Newport. Traffic analytics firm INRIX said there were 145 traffic jams in the eight weeks after the 12-month project started on 9 October - compared to 42 incidents before the work began. But data shows the traffic queues were twice as bad. The worst jam tailed back more than six miles (10km) and lasted almost five hours during morning rush hour on the day after work began. INRIX estimates the economic impact of the roadworks to date is £378,730 in lost time and fuel, but said improvements were an "essential part of life on Britain's roads". Its chief economist, Dr Graham Cookson, said: "Whilst INRIX estimates that they have already cost motorists more than £300,000 in wasted time, fuel and carbon emissions, it's a case of short term pain for long term gain." Approach roads to the Pwll-y-Pant roundabout were initially restricted to one lane from each direction. But that has been extended to two lanes until January - which has eased congested - after complaints the works were affecting trade in Caerphilly's shops. More than 7,000 have people signed a petition urging Caerphilly council to "reconsider the ill-conceived roadworks immediately". Caerphilly MP Wayne David and AM Hefin David have met the council to express "the understandable anger of many thousands of people". They said the council "acknowledged that there is huge public concern" and agreed "everything possible must be done to minimise disruption". Caerphilly council's deputy leader Sean Morgan said: "The council has listened to the concerns of the community and have worked closely with the contractor to deliver these positive changes ready for the critical pre-Christmas period." The authority is offering free two-hour parking in the town centre in a bid to help suffering traders over the Christmas period.